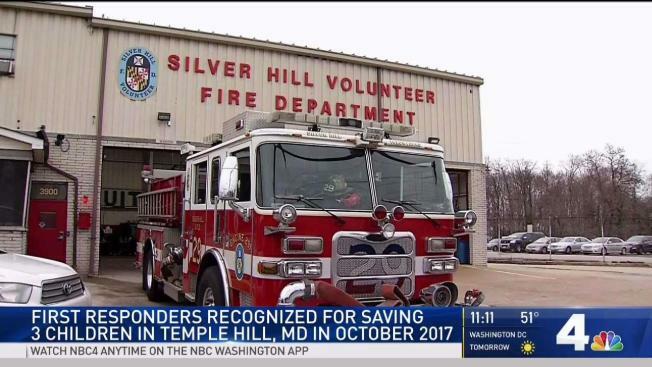 More than three months after three children were pulled from a burning home in Temple Hills, Maryland, the firefighters who rescued them are being honored. The group was honored for their bravery Monday. "Your quick thinking and immediate action on the scene of the incident are commendable," said Prince George's County Fire Chief Ben Barksdale. The firefighters were called to the 4700 block of Alcon Drive around 7 a.m. on Oct. 29, 2017. When they arrived, they were told three children were trapped on the 2nd floor of the home and could not escape. With lives on the line, Lieutenant Mike Perritt launched a two-pronged response; one team would battle the fire while the other searched for the children. "I had one firefighter - Tyler Shoemaker- he took the line to extinguish the fire, and the rest of us split up," Perritt said. Braving dark and smoky conditions, the firefighters found two children in one room and an infant in another. All three were removed from the house, but the children needed "rescue breathing" and the infant required CPR. "When we arrived on scene, they were bringing out a kid to us that was pretty limp. So we just cleaned the kid up, gave him some oxygen and then he perked back up," said medic Amanda Steele. The children responded to the rescue efforts and were taken to the hospital. Meanwhile, Shoemaker was focused on dousing the flames. He never dreamed that months later he'd receive an award for what he considers just doing his job. "I just knew that I had a job to do and just took care of the job," Shoemaker said.